These sharp looking Florsheim FS2400 Composite Toe Dark Brown Leather Oxford Lace-Up Shoes many not look anything like a high-quality work boot, but you'd be surprised. Sporting a handsome, casual look but built with work boot quality in mind, these are Oxford shoe ... (see full details) (see specifications) #FLSFS2400. These sharp looking Florsheim FS2400 Composite Toe Dark Brown Leather Oxford Lace-Up Shoes many not look anything like a high-quality work boot, but you'd be surprised. Sporting a handsome, casual look but built with work boot quality in mind, these are Oxford shoes like none other. The first thing you'll notice about these Florsheim oxford shoes is just how comfortable they are. The dark brown leather uppers feature excellent flexibility and are breathable while also being abrasion-resistant and durable. The Dri-Lex lining will wick moisture away from your feet, keeping your feet comfortable and dry. The removable polyurethane cushion inserts will provide excellent cushioning and the super soft PU midsoles will offer the shock absorption need to keep you going strong where the day takes you. What really sets these shoes apart is what you may not notice right away. Unlike most Oxfords, these Florsheim shoes have been equipped with protective, ASTM F2413-05 M I/75 C/75-rated composite safety toes. They also offer static dissipative protection. The non-slip, direct inject outsoles provide excellent traction. They are also non-marking, making them great for both casual and professional settings. They are also oil-resistant, meaning they can easily stand up to the chemicals found in most oils without breaking down. Don't settle for just any Oxford shoe. Demand the best with a pair of Florsheim FS2400 Composite Toe Dark Brown Leather Oxford Lace-Up Shoes. With their composite safety toes, non-slip soles and moisture-wicking lining, these Florsheim Oxfords go above and beyond. I find this an outstanding shoe with the benefits of a dress shoe, but also a safety shoe. It is very comfortable. I am about to order my third pair of this exact style. They are the best and most comfortable steel toed shoes I have ever owned, and are offered here at a better price than other shoes half the quality! As President of the company, I go from business meetings to inspections in the factory. This shoe fits my needs as a dress shoe, but also safety shoe which is required around the machinery. This is a very comfortable shoe and I would recommend it hghtly. I just ordered my second pair. The one's I have now are still going strong but when the company I work for pay's for them why not get another pair. I have had this pair for 16 months. Wear them every day and even prefer to to take a couple of mile walk in them after work. They are the best shoe I have ever had. 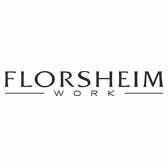 Florsheim Shoes: Men's FS2400 Composite Toe Lace-Up Oxford Work Shoes is being added to your cart.